TouchArcade forum member HansKaosu was first on the scene with his video, and others quickly followed. 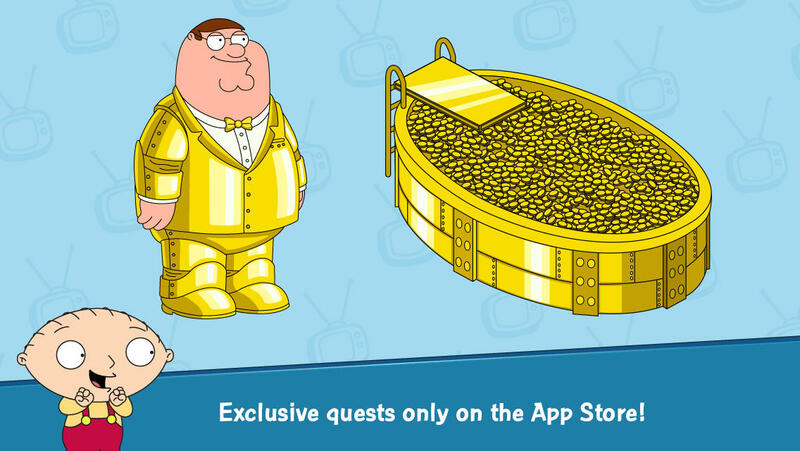 Now, before we go any further with this story, keep in mind, Family Guy: The Quest for Stuff was fully available for download earlier today. No tricks were needed, nothing was stolen or otherwise pirated. Instead, people with New Zealand App Store accounts were just downloading the game like any of us download these games, direct from the App Store without any other associated drama. Hell, this sort of activity is the entire basis of how we do Wednesdays around here, which have turned in to our most exciting day of the week. The New Zealand App Store is no secret. In my opinion, this kind of action against iOS gamers who are merely excited to be playing your game is so ridiculously inappropriate for a publisher to be taking I don’t even know where to start. Copyright claims are serious business. Getting someone’s entire Twitch channel shut down is a drastic measure. 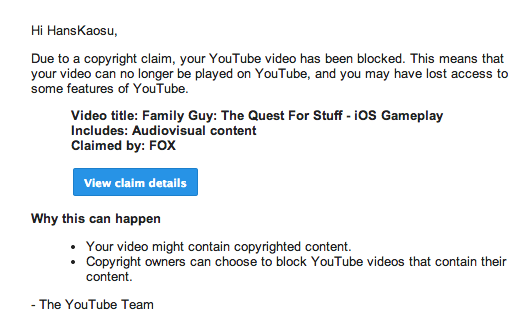 The only reason this didn’t happen to the TouchArcade channel today was because I was too busy with all the news we were posting this morning to download the game in time… Otherwise, I’d be right next to everyone else with a nonexistent Twitch channel and a copyright strike on our YouTube account. FOX, “technical error" or not your game was available for download. No one is stealing anything, violating any copyrights, or anything else ridiculous like that. Recording or streaming video of a game that’s able to be downloaded from the actual App Store, regardless of region, is about as fair use as you get. This is incredibly abusive to the Family Guy fan base, as well as to anyone who was actually stoked enough for the game this morning to go out of their way to start participating in community discussions about it and posting gameplay video. This sort of thing shouldn’t be tolerated, but, I guess when you’re as big as FOX you can basically do whatever you want.